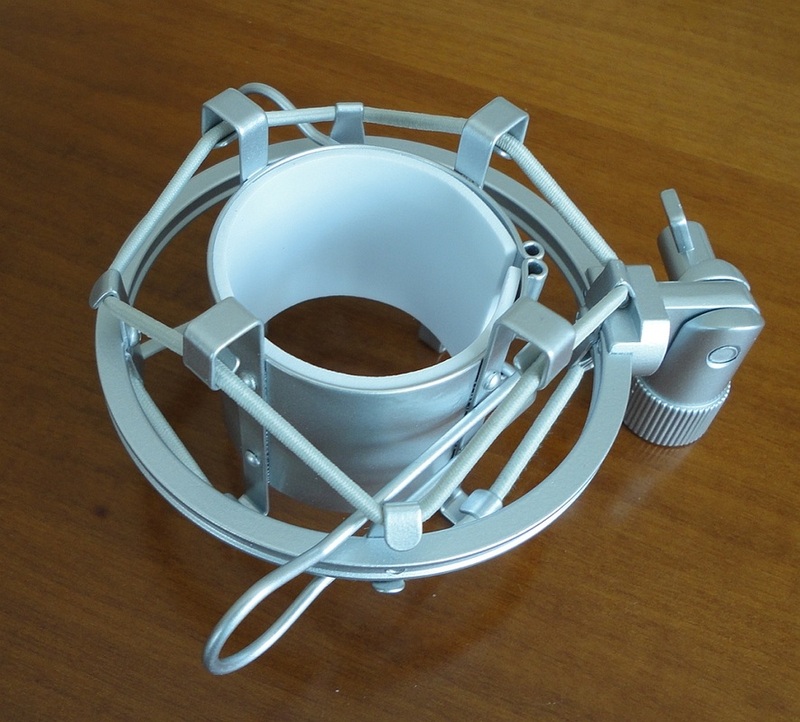 Since we started using them, cardioid condenser microphones have been getting better and better. The first one we bought was a Behringer C-1U and, good as it was, there were issues with pick-up and the resulting volume was on the low side. The free driver ASIO4ALL helped a little but the base problem remained. Down the road, we were sent the Auna CM600 to test and it turned out to be a vast improvement, both in sound quality and ability to pick up decent volume, but there was a slightly muffled quality to the output that has been completely overcome with this new Auna, Model 900. My husband is the musician in the family and he did the testing of this new mic. In one word, he loves it! He makes demos at home with very basic equipment and the great thing about a USB condenser mic such as this one is the easy connection to a computer's sound card via a standard USB plug. No need for a pre-amp or any other specialized equipment. The other plus of a condenser mic is that it draws phantom power from the computer it's attached to (a faint LED light shows through the mesh). The main weakness is that cardioid mics are generally quieter and mostly pick up sound directly in front of them, so you need to be closer and risk the dreaded 'pop' especially on vocals. With this mic, the pop issue has been almost completely resolved, and with the aid of a pop filter, quality recordings are now easy to make (we were lucky to find an On Stage ASFSS6 Dual Screen Pop Filter at a really good price). The sound quality is clearer and sharper than with our previous mics, which is exactly what my hubby was after. Warm and smooth is fine, but he needed a very faithful reproduction and as clean a sound as possible to minimize later manipulation. Another very welcome improvement with this model is the louder volume produced by the enhanced sound capture. The look and feel of the 900 is similar to the CM600, except for the colour which is a fabulous steely blue. Similar weight, same look of quality, solidity and classic elegance. The cradle (shockmount), which is included in the purchase, screws over our existing stand and holds the mic securely at whatever angle is required, providing shock absorption. 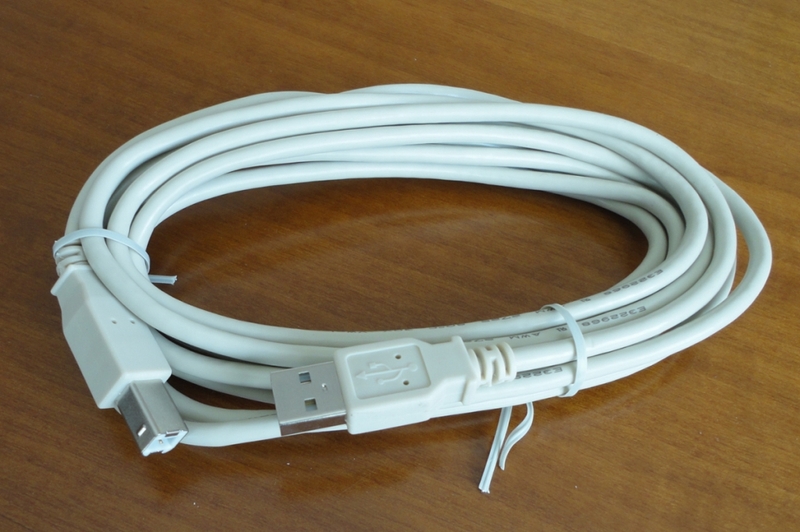 Also included in the purchase is a sturdy and very long (3 m) USB connecting cable; a nice zipped storage pouch, synthetic leather outside and lined with soft and padded material inside for optimum protection; an adapter ring; and a clear manual in English and German. 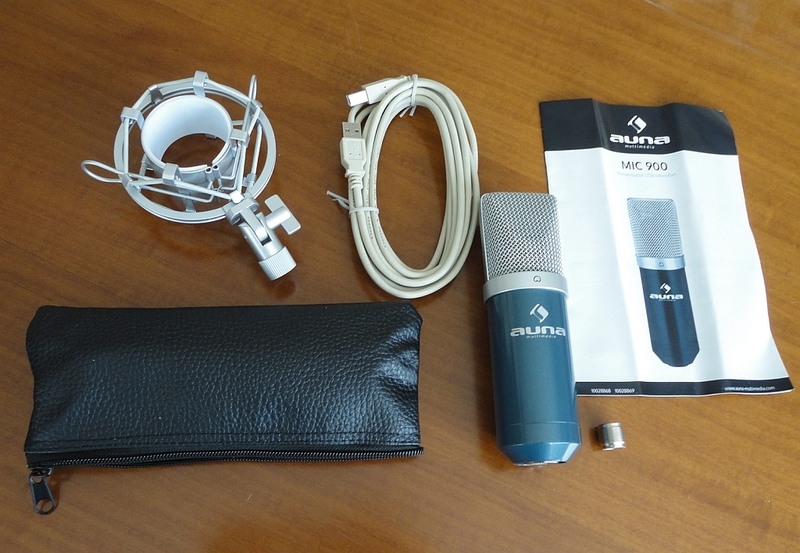 Auna sell packages that include the stand and pop filter, so choose according to what extra accessories you require. 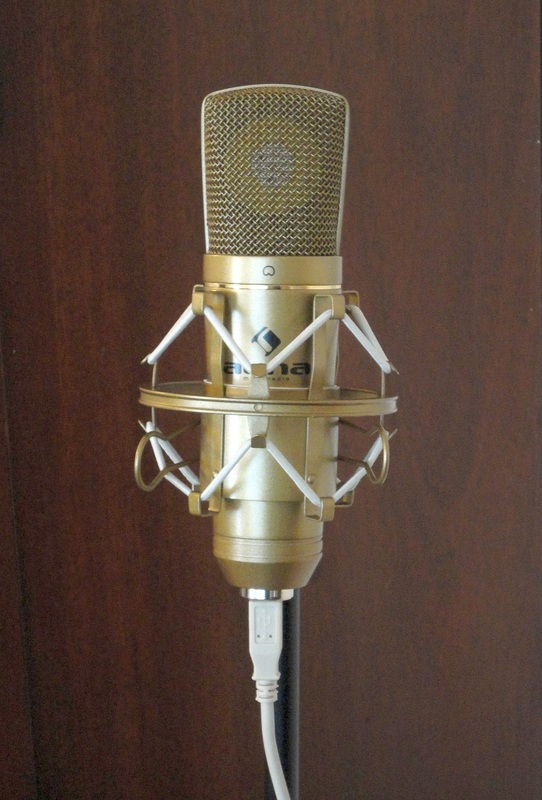 After a lot of comparison and experimentation, this is now my husband's favourite mic and the one he goes to first, both for vocal dubbing and to record guitar and keyboards. He's really impressed and very happy with the sound results he can get. I was sent this microphone for testing purposes and for my honest and unbiased review. In my opinion, it is a terrific condenser microphone at a very reasonable price. 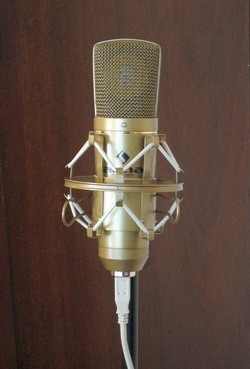 An excellent new entry in the field of condenser cardioid microphones. As musician and songwriter, my husband often needs to make demos at home and, for him, the main benefit of a USB condenser mic is that it connects directly to a computer's sound card via an ordinary USB plug. You don't need a pre-amp or any other specialized equipment. The main disadvantage of these types of mics, especially cardioid which mostly pick up sound directly in front of them, is that they are generally quieter on the pickup and so require close proximity, which gives them a tendency to 'pop' especially on vocals. The Auna is very forgiving and will stay pop-free from around a foot away to 4 inches. 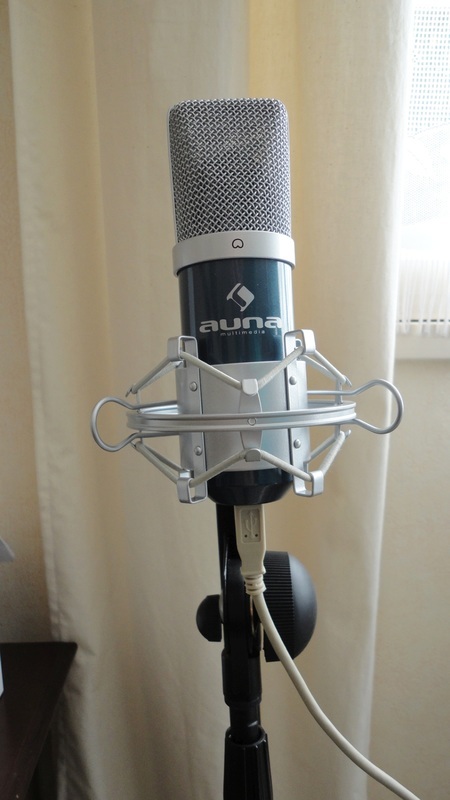 Compared with his Behringer C-1U, this Auna model picks up sound in a much more efficient way, i.e. you don't have to be quite so close to it to produce a very acceptable volume level. This is confirmed by the uptake on Audacity which automatically sets at 40% whereas with the Behringer it would automatically set at around 80%. You get a very clean sound with a warm, smooth tone from both voice and music recording, ready to be manipulated to suit your purposes. The mellow sound you get is almost too round for his style of vocals, but it's fantastic for guitar and keyboard recording, picking up all nuances while effectively excluding background noise. We love the look and feel of the CM600. It's fairly heavy, very attractive in this bronze colour, substantial, and with an air of quality about it. The cradle clip holds the mic securely at whatever angle and provides shock absorption. Through the USB connection, the mic draws phantom power from the computer it is attached to (a faint blue LED light shows through the mesh). We have tested this mic in different ways, as my video illustrates, and are very impressed with the performance and results one can get. 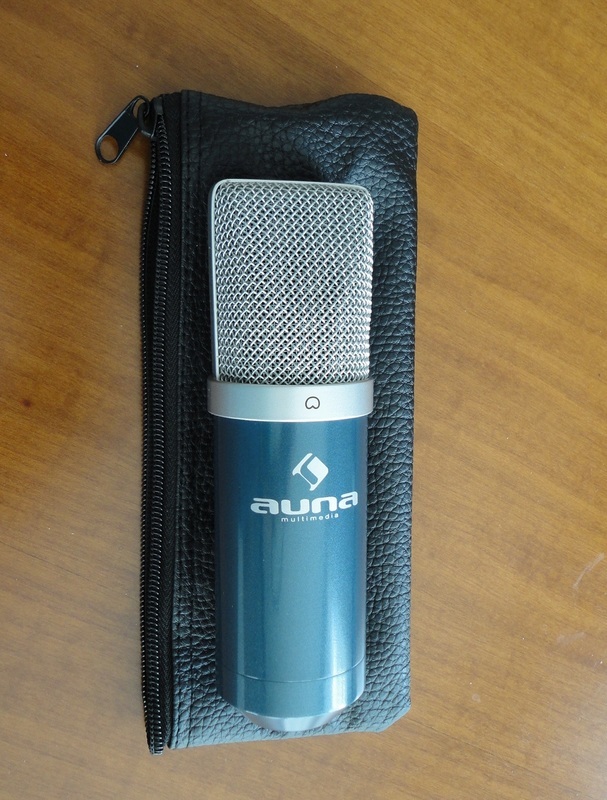 My musico still has a use for his Behringer, but the Auna has become his favourite mic for guitar and keyboard live recording. 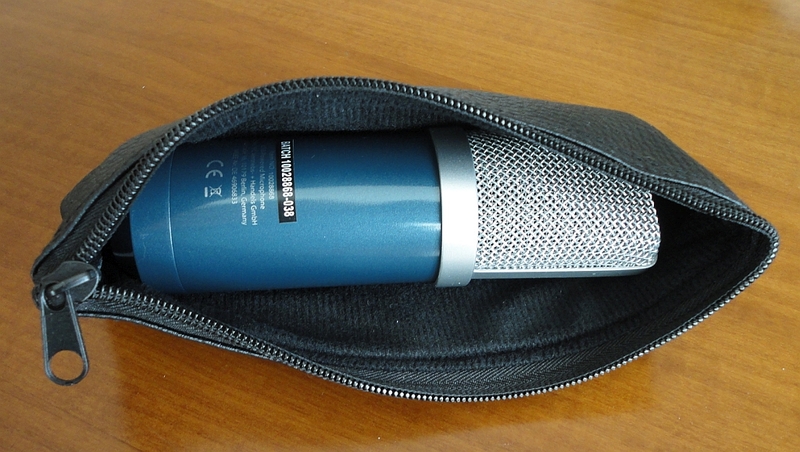 We were given this microphone for testing purposes and for our honest and unbiased review. 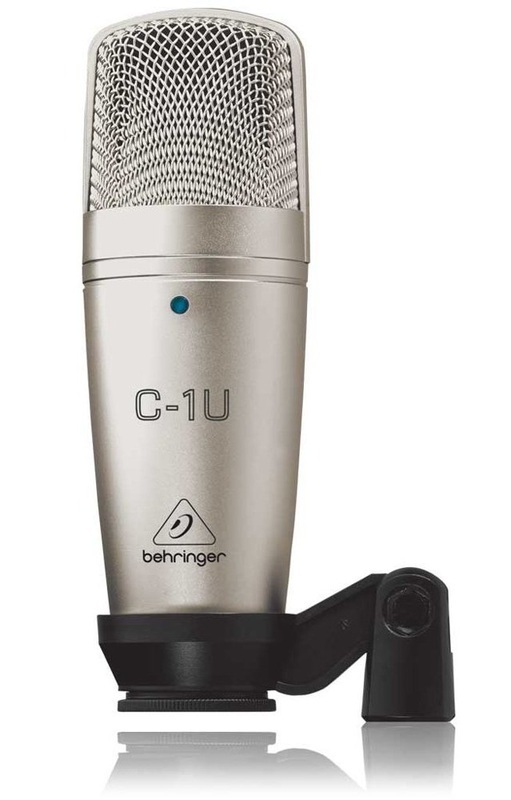 In our opinion, it is a quality microphone at a very reasonable price. Bought to improve the quality of my husband's home music recording efforts without going to the expense and complication of adding a pre-amp box. The selling point for us was the USB connection which is powered by phantom power directly from the computer. When my hubby first got the mic (about four years ago), it took him a longish time to achieve acceptable results, the main problem being that the mic is on the quiet side. To produce the flat, quality sound he was hoping for requires all relevant computer settings to be turned up to the maximum. In the course of doing so, he ran into problems with the Realtek Audio Manager but that was quite possibly due to some limitation with our set-up. What finally worked for him was to separate the input jacks in the Control Panel, Audio Manager (running Windows Vista Home Premium), turn the microphone (input) volume to the maximum in Audacity (having given Audacity control of the mic), and position the mic 5-6 inch from the source (guitar or singer). Also, when I contacted Behringer, they suggested using ASIO4ALL which is an independent universal audio driver for Windows systems. For us it made all the difference and my hubby is now very happy with the recording sound quality he gets. Asio4all is free software which (as I understand it) basically improves the way most computer sound cards work. One thing that puzzled us was that the LED light indicating that phantom power is being received is always green on the mic (we have tried it in 8 different USB ports on 2 different computers) whereas the documentation says it should be blue. I originally thought this indicated insufficient power from the USB port but it seems to have no effect on recording. With his current set-up, my husband is happy with the sound he is getting, there is no hiss and, of course, you've got to love the ease of the USB connection.